Size Array: 10 in., 14 in., 18 in., 22 in. 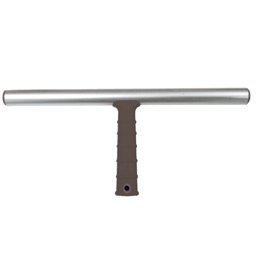 T Bar Handle - Aluminum has Plastic domed end-caps to prevent wear on sleeve ends. Connects to telescopic poles (with cone adaptors for window wash equipment). Designed for use with washer sleeves. Available in 4 sizes: 10", 14", 18", or 22" Our Handle is 5" long. Better than the competition for keeping dryer hands.